(Nanowerk News) Even as the 2014 Nobel Prize in Physics has enshrined light emitting diodes (LEDs) as the single most significant and disruptive energy-efficient lighting solution of today, scientists around the world continue unabated to search for the even-better-bulbs of tomorrow. Scientists from Tohoku University in Japan have developed a new type of energy-efficient flat light source based on carbon nanotubes with very low power consumption of around 0.1 Watt for every hour's operation--about a hundred times lower than that of an LED. 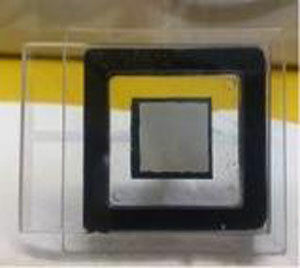 In the journal Review of Scientific Instruments ("Plannar light source using a phosphor screen with single-walled carbon nanotubes as field emitters"), the researchers detail the fabrication and optimization of the device, which is based on a phosphor screen and single-walled carbon nanotubes as electrodes in a diode structure. You can think of it as a field of tungsten filaments shrunk to microscopic proportions. They assembled the device from a mixture liquid containing highly crystalline single-walled carbon nanotubes dispersed in an organic solvent mixed with a soap-like chemical known as a surfactant. Then, they "painted" the mixture onto the positive electrode or cathode, and scratched the surface with sandpaper to form a light panel capable of producing a large, stable and homogenous emission current with low energy consumption. "Our simple 'diode' panel could obtain high brightness efficiency of 60 Lumen per Watt, which holds excellent potential for a lighting device with low power consumption," said Norihiro Shimoi, the lead researcher and an associate professor of environmental studies at the Tohoku University. Brightness efficiency tells people how much light is being produced by a lighting source when consuming a unit amount of electric power, which is an important index to compare the energy-efficiency of different lighting devices, Shimoi said. For instance, LEDs can produce 100s Lumen per Watt and OLEDs (organic LEDs) around 40. Although the device has a diode-like structure, its light-emitting system is not based on a diode system, which are made from layers of semiconductors, materials that act like a cross between a conductor and an insulator, the electrical properties of which can be controlled with the addition of impurities called dopants. The new devices have luminescence systems that function more like cathode ray tubes, with carbon nanotubes acting as cathodes, and a phosphor screen in a vacuum cavity acting as the anode. Under a strong electric field, the cathode emits tight, high-speed beams of electrons through its sharp nanotube tips -- a phenomenon called field emission. The electrons then fly through the vacuum in the cavity, and hit the phosphor screen into glowing. "We have found that a cathode with highly crystalline single-walled carbon nanotubes and an anode with the improved phosphor screen in our diode structure obtained no flicker field emission current and good brightness homogeneity," Shimoi said. Field emission electron sources catch scientists' attention due to its ability to provide intense electron beams that are about a thousand times denser than conventional thermionic cathode (like filaments in an incandescent light bulb). That means field emission sources require much less power to operate and produce a much more directional and easily controllable stream of electrons. In recent years, carbon nanotubes have emerged as a promising material of electron field emitters, owing to their nano-scale needle shape and extraordinary properties of chemical stability, thermal conductivity and mechanical strength. Highly crystalline single-walled carbon nanotubes (HCSWCNT) have nearly zero defects in the carbon network on the surface, Shimoi explained. "The resistance of cathode electrode with highly crystalline single-walled carbon nanotube is very low. Thus, the new flat-panel device has smaller energy loss compared with other current lighting devices, which can be used to make energy-efficient cathodes that with low power consumption." "Many researchers have attempted to construct light sources with carbon nanotubes as field emitter," Shimoi said. "But nobody has developed an equivalent and simpler lighting device." Considering the major step for device manufacture--the wet coating process is a low-cost but stable process to fabricate large-area and uniformly thin films, the flat-plane emission device has the potential to provide a new approach to lighting in people's life style and reduce carbon dioxide emissions on the earth, Shimoi said.